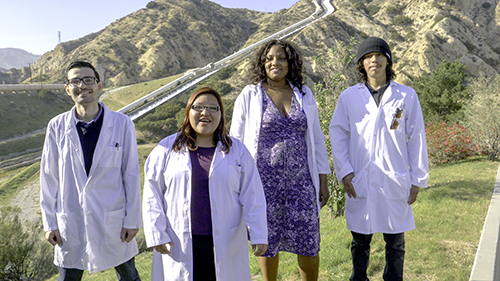 SYLMAR, CA – Los Angeles Mission College was named a top-ten finalist for the National Science Foundation’s fourth annual Community College Innovation Challenge, college officials announced today. L.A. Mission College’s team presented their proposal for using wastewater to generate electricity throughout Los Angeles. The team includes biotechnology students Thibault Angouillant, Karla Martinez Hurtado, Mary Abrams, Juan Sosa Matute, and faculty mentor, Stephen Brown, PhD. The NSF challenge requires teams to assess their innovation’s potential impact, identify its scientific and market feasibility and determine its societal relevance. Teams then must submit written and video entries. According to Dr. Tajkarimi, the NSF challenge strengthens entrepreneurial thinking among community college students by challenging them to use science, technology, engineering and mathematics to find innovative solutions to real-world problems. Finalists will attend an NSF-AACC-sponsored Innovation Boot Camp in Alexandria, Virginia, in June. At the boot camp, students will interact with entrepreneurs and experts in business planning, stakeholder engagement, communication and marketplace dynamics. For more information about L.A. Mission College’s Biotechnology efforts, contact Alejandro Guzman, 818.833.3431.